Thanks, looks as if they have at least some of the right kind of thing. NP, fun to see you hanging out over here! Complainy question: Where did everybody go? Im at work. Is hot. I am unsuccessfully taking a nap. Too much caffeine in the blood. Why did I drink that coke at dinner? Everybody is different, but I find that I sleep much better when I am not typing on a keyboard. ...yeah, saw it was supposed to be near 100° where you are. Where I am we didn't make it out of the 40s and with a lovely cold rain to boot. ...it used to rock even more when they still used Sassafras root and cane sugar in the recipe instead of all that artificial gunk and Fructose™ (or in teh case of Diet A & W, Aspartame) they put in it today. Still have fond memories of going to the roadside stand on Lakefront Drive on the south side of Milwaukee to get that big ol' brow jug filled with that loverly creamy root beer goodness. ...and their cheeseburgers put those upstarts with the golden arches to shame. 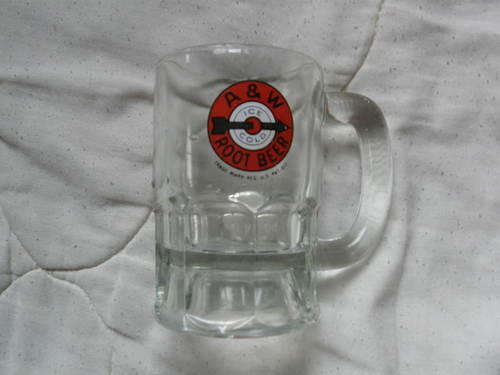 I still have a couple of the old glass mugs from that era with the original "Bullseye" logo like in the pic below. Buggers are heavy, you could use them in self defence. ...my Leela likes blue, it's a very peaceful colour. i) my hifi system is on its last legs. Not a real complaint - I bought the actual system, sans CD, in 1986 - but it is reaching the point where I have to give in and replace it (turntable won't work, radio reception sometimes drops, switching input often takes several pushes of the button and sometimes loses the connection spontaneously). However, as I've been looking around the CD player, which is newer (though still from 2000), has started to get fussy and even refused to play three discs that played fine via the PC, adding another item to be replaced to the list. ii) in pursuit of the above, I have been trying to decide what to get. Typing brand + model + review into Google brings up page after page of store sites which don't have any actual reviews of the bloody item. iii) tuners seem to be in very short supply, at least at the relatively affordable end of the market. I know this is a weak area for digital TV signals so I assume the same is likely to be true of DAB radio, but the lack of reviews (see ii) means I have no idea how the few models I can find perform as FM radios with the supplied aerial (external aerial not being an option). ...the heart of my former Hi-Fi system, a Kenwood TK-140, was made in the 60s (and made right here in the USA, not Korea where they have farmed all their work out to since the 80s). While it's not not tube, it does come from the early days of Transistors, everything hand soldiered. It may look cheesy compared to today's systems with it's large dials and white selector switches reminiscent of the stop tabs on a Hammond organ, but who in their right mind buys a Hi-Fi for looks (and if they do, they are missing the point)? I still have the original owners manual which lists about a dozen and a half shops in the nation for servicing on the back cover one of them the original Hi-Fi-Fo-Fum store on, "Twenty Sixth [cymbal tap] and Wisconsinum" in Milwaukee. Case is steel, transformers are beefy so the unit weighs a tonne. It has a frequency response of 0 - 55,000hz which, while beyond of the normal human hearing range (which is why most commercial systems roll off at 20 - 32hz on the low end and 18k - 20k on the upper end) it still has a noticeable effect in that the music sounds incredibly clear since the wider "window" allows "transients" and upper partials to be reproduced, which in turn, faithfully brings out unique character of the instruments recorded (I primarily listen to classical and jazz). So one actually gets a sensation of the bow of a cello being drawn across the strings, the plectra on a harpsichord plucking the stings or the the intimate interplay of an acoustic jazz quartet. The unit also has a pre-amped third channel output (perfect for a subwoofer) and though it only puts out 85W/channel (8 ohms) with it's high current configuration (thanks to those huge transformers) it has a real "presence" and can easily handle the peaks with out "clipping". The speakers are 2 way JBL Recording Studio monitors (totally flat response with driver magnets as big as the bass cones - and they do "move air" if you put your hand in front) and the turntable (Yes I still have quite a collection of those flat black things they called "records") a totally manual radio station reference model. As I was tested up to 31k and down to 16hz (yes I can actually hear a 32' organ pipe as a musical tone, not just a bass rumble) I am difficult to please when it comes to audio gear. Can't stand listening to the run of the mill rubbish most electronics and even so called "audio specialists" shops push today. Now when I said "former" above, the unit is unfortunately not working due to an incredibly stupid flat mate I had years ago who tried to wire it up to make a home theatre system and succeeded in blowing one of the channels out and killing several of the controls. Needless to say I moved out the next week (and this is just one of the reasons I no longer wish to deal with shared living arrangements). Still looking for the parts and a place to effect the repairs. ...ohh, and this baby still needs the old FM Dipole antenna to pull in my favourite classical and jazz stations. So if I'm reading this right these Hi-Fi's sound better than my I-Pod, Right? JK! Don't hunt me down and kill me. Seriously, I listen to YouTube on a laptop over here. While drinking Safeway store-brand seltzer. Hated CDs when they first came out because they sounded too squeaky clean and "sterile". Engineers had to actually introduce algorithms to "dirty up" the signal and make it sound more like a real record. I still have bunch of Angel Mono LPs of Debussy and Mozart that sound like the piano is there in the room with me. Digital is "0s & 1s" , "on - off". Real life sound isn't. That is why records still rule. I feel the same way about digital photography. Gimme an SLR loaded with a roll of High speed Ektachrome or Tri X Pan any day. ...momma don't take my Kodachrome away... (alas, Kodak did a few years ago). Damn Powerball. Here I was going to give DAZ half of the winnings so they could get the store working right. Sorry DAZ, maybe next time. Oh yeah. I was also going to invest in Jaderail turning himself into a cat. I was looking forward to that. Well, you said potions were out, I could whip up a nice Spell given enough time and the proper funding. Material Components for high level spells do not come cheap. What kind of funding, I only won $200,000 on the Powerball. You think that might be enough? Would like it in a check or just wire you the cash? ...nobody liked my goofy song a few pages back? Guess I still have a day job. At my age that would pretty much set me up for the rest of my life. ...then again, maybe I won the Megabucks. That all? Not worth the trouble, One powdered Gem could run that much. WHAT? Where? This thread grows so fast I miss LOT's of it. Damn! I'll check into finding a few investors then. I think this might work. Okay, I missed that. Pretty darn good in my book. But What TUNE? I know Steve's stuff, well some. ...no specific tune, more his style (forgot to put the harmonica licks in). Love Stevie. Man's got soul. ...anybody hear from Wooly lately? Damn! I'll check into finding a few investors then. I think this might work.Ahh!! Well, I also own this Bridge... tell the investors I'll toss it in for Free. Darn, you would point that out. Now I'll fret over Wooly till he posts.